Retro cars fleet of Authentic Slovakia is getting bigger. To satisfy the needs and desires of growing number of our clients, we are happy to invite a legendary Czechoslovak 8-seater, produced in Trnava (Slovakia) in 1992. Škoda 1203 was being produced in (almost) the same design for amazing 31 years (1968 – 1999). Production was launched in 1968 in Czech town Vrchlabí, 5 years later part of the production was moved to Slovak town Trnava (50 kilometres north from Slovak Capital, Bratislava). 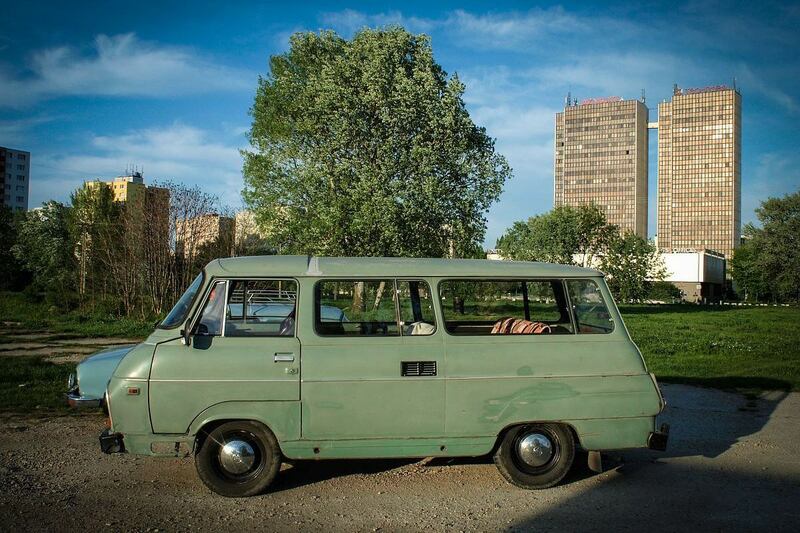 Since 1981, all of these immortal cars were made in Trnava. The name changed to TAZ 1500. Production was over as late as in 1999, due to low sales – why so? Škoda 1203 cars were often used as ambulance cars, funeral cars or utility vehicles. What is unique, the engine is located in the interior, right next to the driver, so anyone can take a look what is going on during the ride, when in doubts! The level of noise inside of the car is crazy, stability of the car is horrible and it is probably the crappiest vehicle produced in Czechoslovakia ever. But joy from the ride is all worth it! Our happy visitors (4-7 pieces) can try this legend during our Post Socialist City Tour.